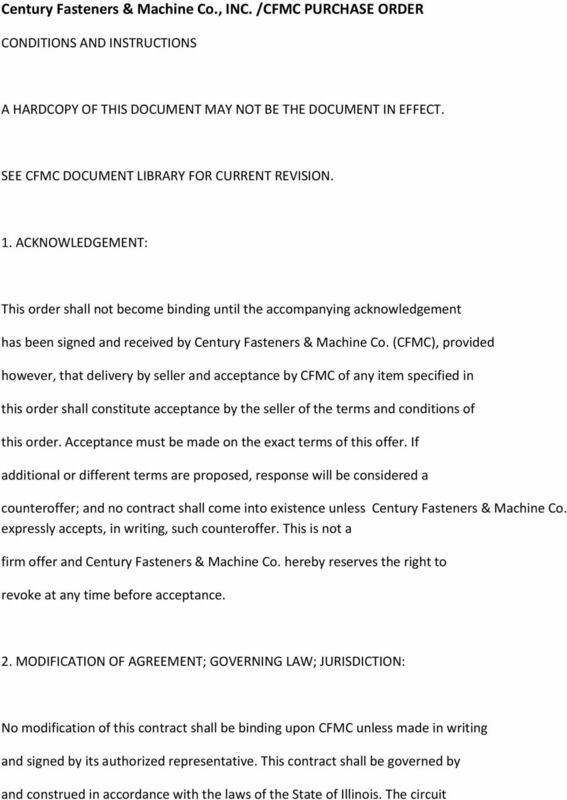 Download "Century Fasteners & Machine Co., INC. /CFMC PURCHASE ORDER"
4 purchase order, the order will not be considered complete until the full quantity(s) specified on the purchase order is received. 7. 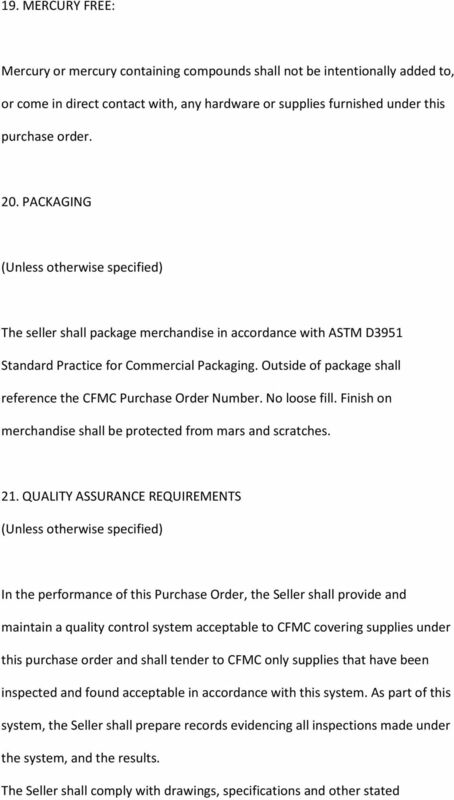 MATERIALS AND EQUIPMENT FURNISHED BY CFMC: Any materials furnished by CFMC on other than a charge basis in connection with this order shall be deemed to be held by seller on consignment. The seller agrees to pay CFMC's cost for all such material spoiled or otherwise not satisfactorily accounted for over and above 2% thereof allowable for scrap loss. Any tools, dies, jigs, or other equipment or facilities hereinafter referred to as (tools) required for the fabrication of materials, units or parts described on the face of this order and which are furnished or paid for by CFMC, are now and shall remain the property of CFMC to be disposed of only on written instructions from CFMC, and shall be returned to CFMC on demand. 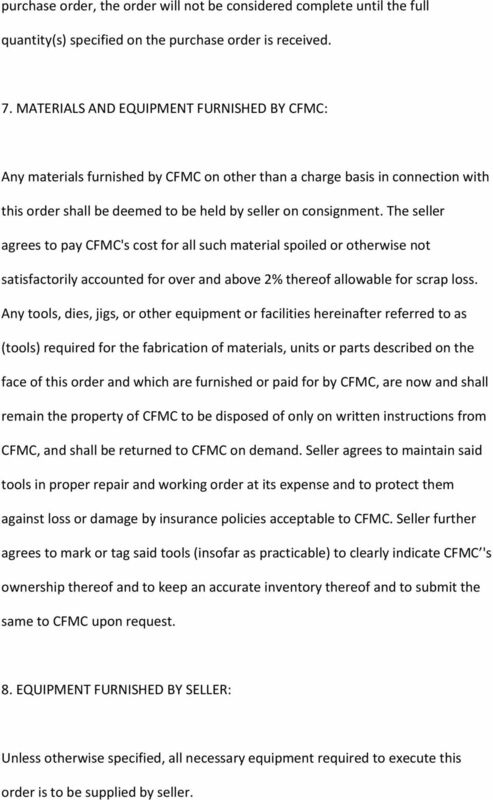 Seller agrees to maintain said tools in proper repair and working order at its expense and to protect them against loss or damage by insurance policies acceptable to CFMC. 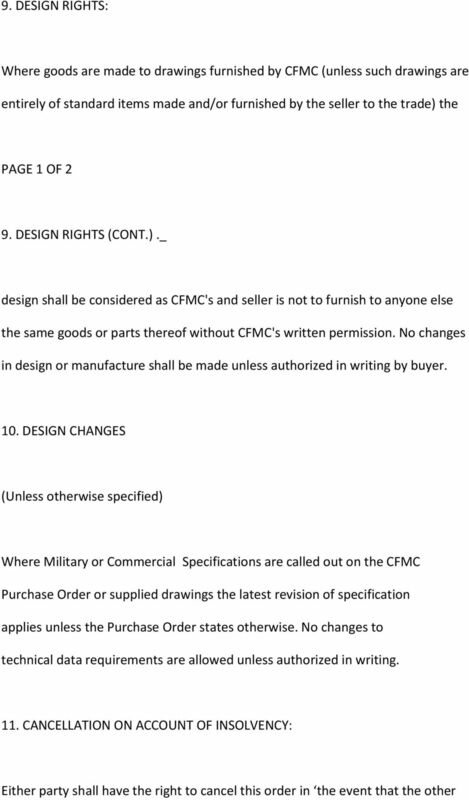 Seller further agrees to mark or tag said tools (insofar as practicable) to clearly indicate CFMC 's ownership thereof and to keep an accurate inventory thereof and to submit the same to CFMC upon request. 8. 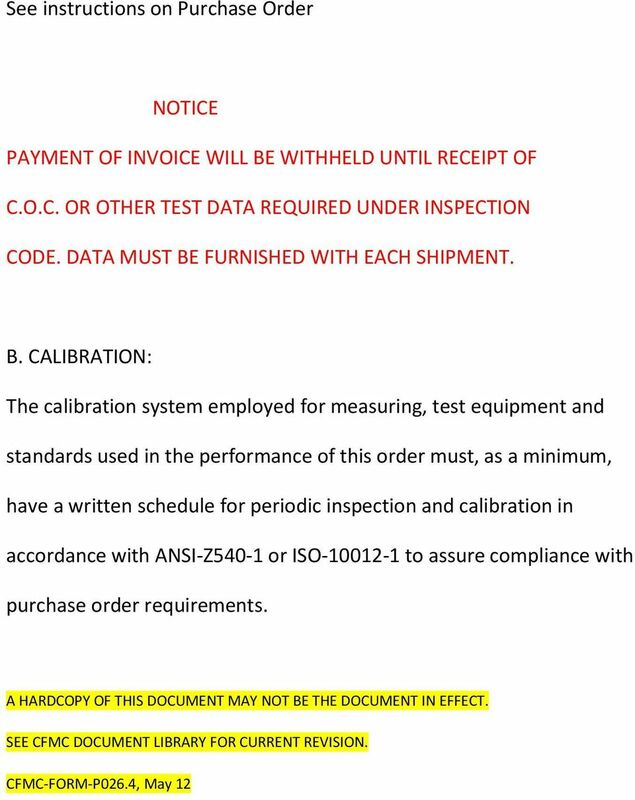 EQUIPMENT FURNISHED BY SELLER: Unless otherwise specified, all necessary equipment required to execute this order is to be supplied by seller. 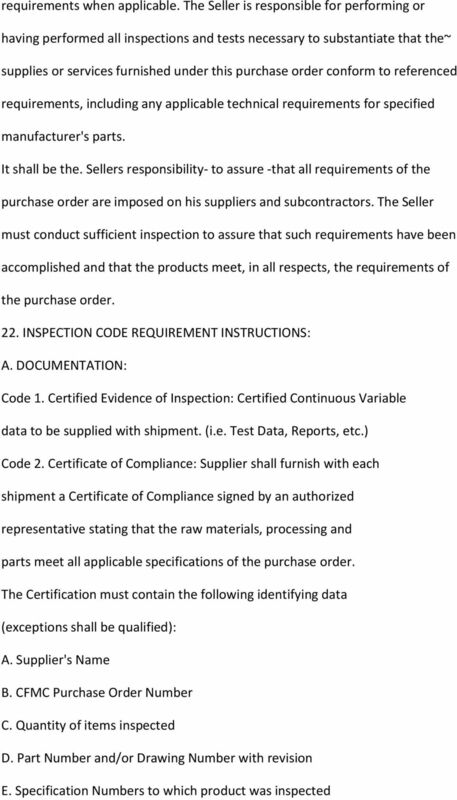 12 Warranty of Data The provisions of the contract clauses set forth in the above paragraphs of the FAR and DFAR, as applicable and as in effect on the date of this purchase order by reference with the same force and effect as though herein set forth in full. 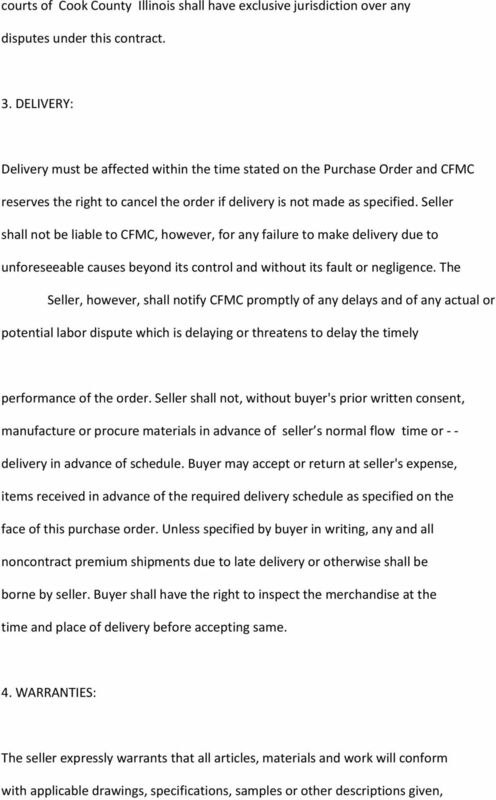 All such clauses shall with respect to the rights, duties and obligations of the buyer and seller there under, be interpreted and construed in such manner as to recognize and give effect to the,contractual relationship between the buyer and the seller under this purchase order and the right of the U.S. Government with respect thereto under the prime contract from which such clauses are derived. 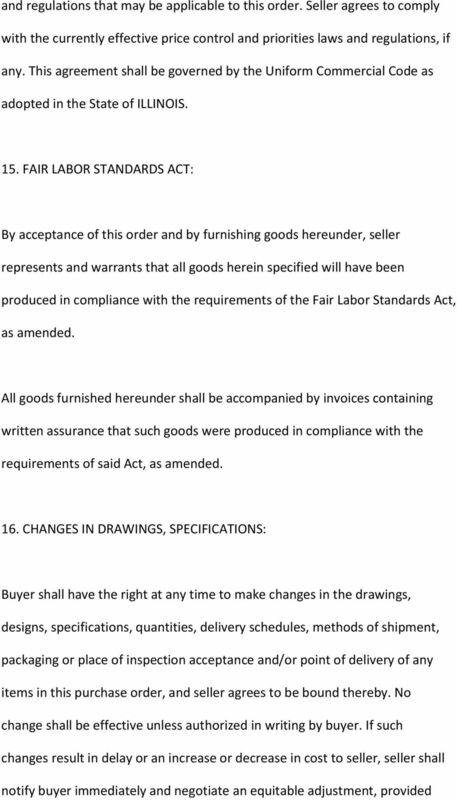 As used herein and as necessary to make the contract applicable to this purchase order, the term "contractor" shall mean seller; the terms "contract" shall mean this purchase order and "subcontract" means seller's purchase order or subcontract issued under this purchase order. 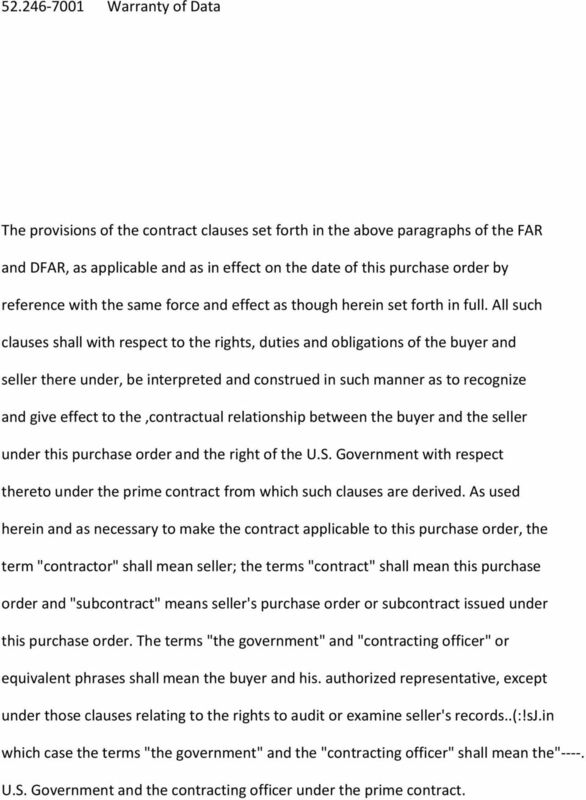 The terms "the government" and "contracting officer" or equivalent phrases shall mean the buyer and his. authorized representative, except under those clauses relating to the rights to audit or examine seller's records..(:!sj.in which case the terms "the government" and the "contracting officer" shall mean the"----. 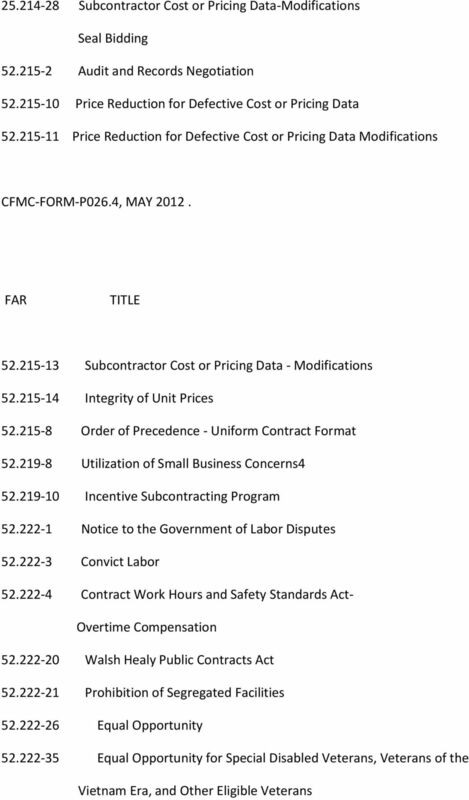 U.S. Government and the contracting officer under the prime contract. 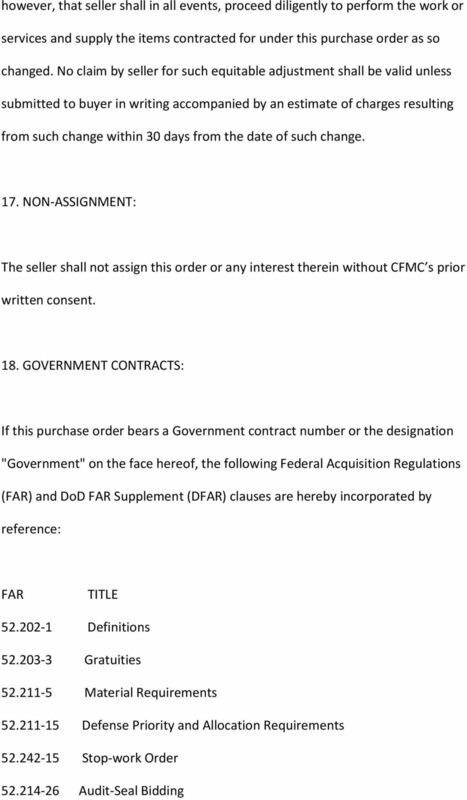 General Terms and Conditions of Purchase Supplement 1 Federal Acquisition Regulation (FAR) Government Contract Provisions 1. 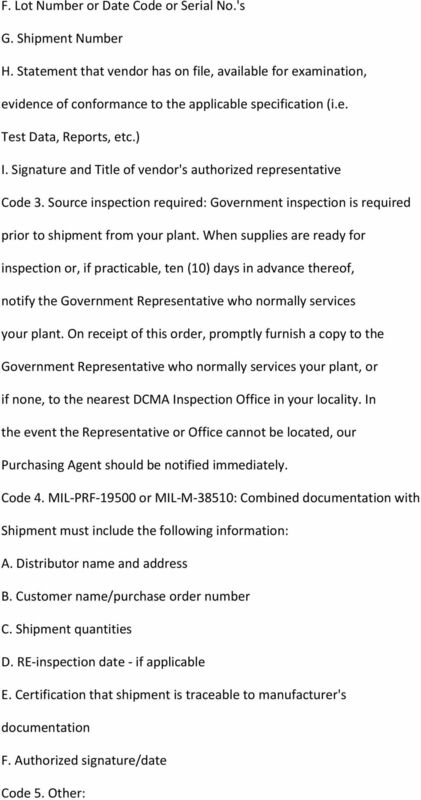 When the materials or products furnished are for use in connection with a U.S.
5.0 Quality Management System The Supplier shall provide and maintain a quality system that meets ISO 9001 or other nationally recognized standard. 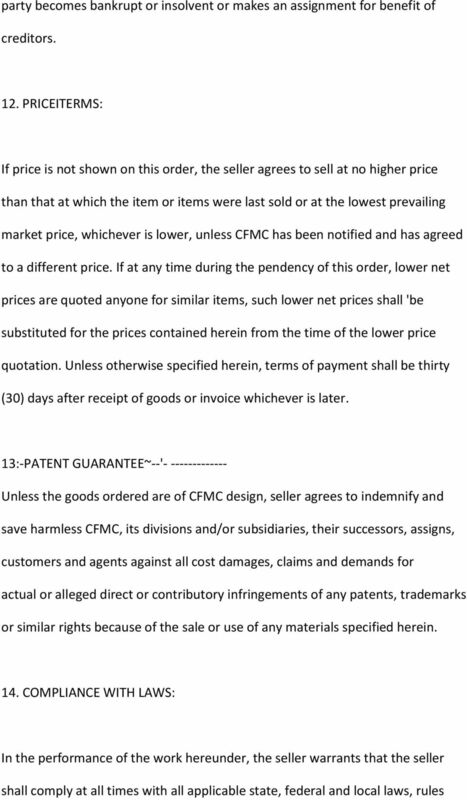 No change, modification or revision to this PO shall be valid and binding unless in writing and signed by the authorized representative of Buyer. General Terms and Conditions of Purchase Supplement 1 Federal Acquisition Regulation (FAR) Government Contract Provisions 1. 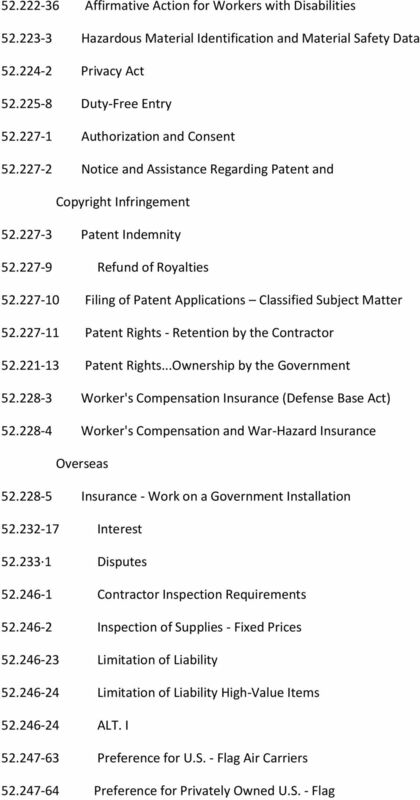 When the products or services furnished are for use in connection with a U.S. 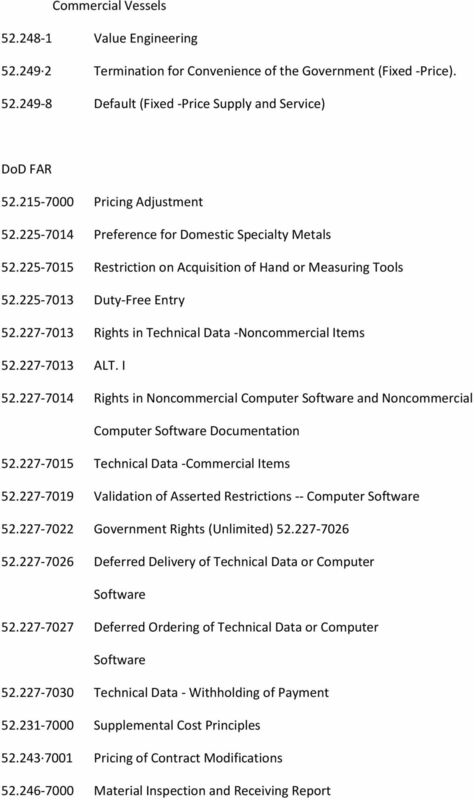 SECTION 2 THE BOEING COMPANY GENERAL PROVISIONS FIXED PRICE SERVICES CONTRACT GP2 SECTION 2 TABLE OF CONTENTS THE BOEING COMPANY GENERAL PROVISIONS FIXED PRICE SERVICES CONTRACT - GP2 1. FORMATION OF CONTRACT. replacement cost with less payable to Buyer, and Seller shall provide routine maintenance at its expense. QNX Software Systems or QSS means QNX Software Systems International Corporation. INVOICE TERMS AND CONDITIONS OF SALE (QNX Software Systems designated below as "Seller") DEFINITIONS In these Terms: QNX Software Systems or QSS means QNX Software Systems International Corporation. "Software"
Request For Price. Work Schedule The project shall commence within a reasonable time of the request. 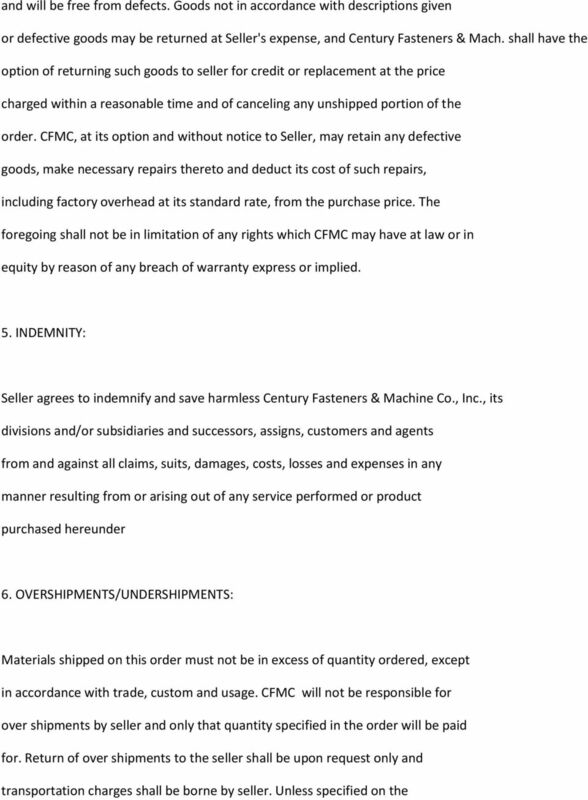 PURCHASE ORDER TERMS AND CONDITIONS This Purchase Order includes and is subject to the following covenants, terms and conditions. the absence of such designation, to the carrier selected by Kidde for shipment to Buyer. TERMS AND CONDITIONS MAINTENANCE SERVICES. Value Added Asset Management Pty Ltd shall hereinafter be referred to as "Value Added Asset Management".